KMUTT is a leading research university of science and technology in Thailand and in Southeast Asia. It has an excellent reputation for educating industry-relevant scientists and engineers who are adept at translating theory into practice, and is also widely recognized for its ability to apply knowledge to the solution of real world problems. About one third of our students or 6,000 out of 18,000 are at the graduate level. The university is currently ranked 2nd in Thailand and 5th in ASEAN by the Times Higher Education World University Rankings, with high performance in research citation and industry income. The research efforts at KMUTT are focused on 7 strategic themes, namely: bioeconomy, sustainable energy and environment, sustainable mobility, smart manufacture and construction, digital transformation, smart health care, and innovative and creative learning society. Many faculty members conduct research in the areas of material sciences and materials engineering that address the challenges of nearly all the above themes. For example, we conduct research into light weight, high strength materials for automotive industry; smart materials and biomaterials for health care; nano materials for solar PV and sensors; biomass for materials and chemicals, etc. Apart from master and doctoral degree programs in materials engineering, energy technology, environmental technology, chemical engineering and chemistry, a new master degree program in nanoscience and nanotechnology has also been introduced recently. The university is also committed to international cooperation in research and education. Indeed as part of its internalization efforts, KMUTT has 143 active student and exchange agreements with universities outside Thailand. Khon Kaen University (KKU) was one of four regional universities established in 1964 as part of a decentralized development plan for higher education in Thailand. The university is a hub of education in northeast Thailand. It is widely recognized university in Asia. KKU offers a wide range of programs: its comprehensive academic program offers 105 undergraduate majors, along with 129 master’s degree programs (25 masters of science) and 59 doctoral programs (9 at the faculty of science). Khon Kaen University was ranked 21st in Southeast Asia by Time Higher Education in 2009, and 4th in Thailand by The Office of Higher Education Commission. The department of physics offers 2 programs: physics, materials science and nanotechnology of undergraduate, master and doctoral of science degrees. The material science research group is in 3 affiliates of research activities: The Integrated Nanotechnology Research Center of KKU, Thailand Center of Excellence in Physics (ThEP), Nanotec – KKU Center of Excellence on Advanced Nanomaterials for Energy Production and Storage. They produce annually more than 30 research papers in ISI database. The Socialist Republic of Vietnam currently cooperates in the domain of higher education through state agreements, agreements of the higher education institutions, limited cooperation with international companies and individual participation in international projects. The Socialist Republic of Vietnam also participates in the EU programmes for cooperation in the field of science and education, and those are Erasmus+ and Horizon 2020 programmes. The Hanoi University of Science belong in the structure of the Vietnam National University in Hanoi (name changed at the present as VNU University of Science, abbreviation by VNU-HUS), which was formerly known as Indochina University, is the leading university of Vietnam responsible for training and basic research in science. It is widely recognized for its quality training and research, administrative leadership, outstanding faculty and student body, as well as having a physical infrastructure similar to that of a prestigious university. In 2016, the overall ranking ASIA of Vietnam National University in Hanoi (VNU) is ranked 139th among the best Asian Universities (while no other university of Vietnam are ranked in the top 150 of the best Asian Universities). It is also the first time two areas which are Natural Sciences and Life Sciences and Medicine of VNU are ranked in the top 100. 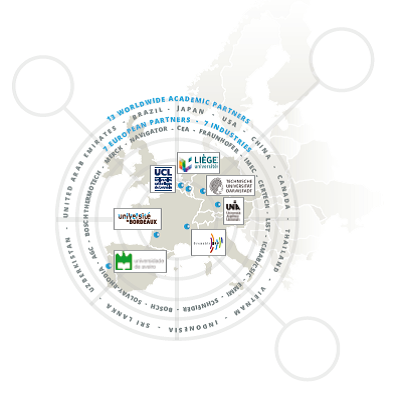 At the present, the University has established relationship with many reputable international partners as a basis for collaborative efforts in research and education. The University has been considered as a national leader for successfully implementing many aspects of Project 911 administered by the MOET including graduating both master (the Master Program in Advanced Chemical Polymeric Materials & Environment) and PhD degree candidates in collaboration with internaztional universities. Surabaya is the second big town after Jakarta as a capital of Indonesia. State University of Surabaya (Unesa) is one of public universities in Surabaya, East Java Province. It has established since 1964, with the main focused on education domain. Since 1998, Unesa has the wider mandate from Ministry of Education and Culture to open new study programs in: natural sciences, social sciences, technique, and vocational. Unesa has many international collaborations with other universities in Asia, Australia, United State of America, and Europe. These international collaborations have focused in student and lecture exchange program, join research, join publication, and technical assistance for institutional developing. Turin Polytechnic University in Tashkent (TTPU) is a new educational establishment in Uzbekistan, which was born in 2009 on the basis of a Cooperation Agreement signed with the Politecnico di Torino (Italy) that aims to develop four HE curricula in Engineering BS and MS in Uzbekistan in accordance with the European HE system, ECTS and acknowledged from both, the Uzbek Ministry of Education and the Italian legislation. The University of Sharjah was established with the aim and vision to contribute to the qualities shared by renowned universities around the world. The education and research programs they offer tend to be comprehensive and multi-disciplinary (from Physics, Chemistry Biology, Medical, Pharmacy, Dentistry to Humanities). The University of Sharjah has 14 colleges and offers 94 programs at the bachelors, masters, doctoral and diplomas levels. Research is carried out by interdisciplinary research teams organized in research groups and research centers of excellence. Center of Excellence in Advanced Materials Research as well as 14 research groups in key areas of science and engineering have been established. Actually more than 15,000 students are enrolled at University of Sharjah. Efforts are under way to establish three additional research centers of excellence in the fields of: renewable energy technologies; sustainable infrastructure and built environment; and information, communication and network technologies. The University of Sharjah funds through a wide range of research grants for researchers and research assistantships for graduate students. These include seed grants for new faculty members, competitive research grants, and collaborative research grants with external public and private organizations, targeted research grants, and undergraduate and graduate students’ research grants. The University of São Paulo (Universidade de São Paulo, USP) is a public university in the Brazilian state of São Paulo. It is the largest Brazilian public university and the country’s most prestigious educational institution, the highest ranked university in Latin America. USP is involved in teaching, research and university extension in all areas of knowledge, offering a broad range of courses. The university was founded in 1934, and with more than 80 years of an intense search for excellence, USP is now part of a select group of institutions of high world standing. Its undergraduate program consists of 249 courses, dedicated to all fields of knowledge, distributed in 42 units of learning and research and offered to more than 58 thousand students. The graduate program is composed of 239 programs (with 332 Masters degree courses and 309 Ph.D courses). In order to carry out its activities, USP counts on various campi, distributed in the cities of São Paulo, Ribeirão Preto, Piracicaba, São Carlos, Santos, Pirassununga, Bauru and Lorena, besides units of learning, museums and research centers located outside these spaces and in different municipalities. Okayama University is a comprehensive University offering 15,000 students in a wide range of courses in all disciplines from Physics, Chemistry Biology, Medical, Pharmacy, Dentistry to Humanities, and strongly relies on the excellent quality of the basic and applied research performed in all fields. Okayama University was awarded a Research University grant (“Program for promoting the enhancement of research Universities”) in 2013 and a “Top Global University project” in 2014 by MEXT (Ministry of Education, Culture, Sports, Science and Technology, Japan). Those supports are expected to significantly strengthen our international research and education capabilities. Drexel University is a private institution that was founded in 1891. It has a total undergraduate enrollment of 14,138, its setting is urban, and the campus size is 96 acres. Drexel University holds a unique place in the academic community as Philadelphia’s technological, cooperative education university. The first university to mandate students to own computers and the first to operate a fully wireless campus, technology is integrated into every aspect of the University. Drexel focuses on experiential learning through its cooperative education program, one of the nation’s largest and oldest. The University’s service-learning initiative, the country’s largest campus-based program of its kind, complements cooperative education by allowing students to utilize the resources of Philadelphia as a “living laboratory”. Drexel’s thriving multidisciplinary research enterprise has erased boundaries between academic specialties. As a comprehensive university, Drexel includes the nation’s largest private medical school and newest law school. Drexel’s thriving multidisciplinary research enterprise has erased boundaries between academic specialties. Students at Drexel University can get a mix of in-class education and extensive on-the-job experience before graduation. Drexel operates a cooperative education program, sending students to more than 1,600 employers worldwide for six months at a time. Soochow University was originally founded in 1900. Now it grows into a university with the national “211” project and a “2011 project” in China. Currently, Soochow University has 26 post-doctoral programs, 24 main discipline doctoral program, 167 doctoral programs with emphasis, 47 main discipline master’s programs, 244 master’s degrees with emphasis, 21 professional master’s programs, and 124 undergraduate programs. At present, it has more than 50,000 students, including ~14,000 graduate students, ~25,000 undergraduates, and more than 1000 international students. It has more than 4900 staffs, including five members of the Chinese Academy of Science and Engineering. In Soochow University, about 4 colleges are involved in materials/polymers science, including College of Physics, Optoelectronics and Energy, College of Chemistry, Chemical Engineering and Materials Science, College of Textile and Clothing Engineering, and College of Nano Science & Technology. The Center for Soft Condensed Matter Physics & Interdisciplinary Research, which is affiliated to the College of Physics, Optoelectronics and Energy, is an innovative scientific platform in Soochow University focusing on the physical aspects of soft materials. University of Waterloo, positioned at the core of the “Canadian Silicon Valley”, in the great Toronto area , a place internationally especially acknowledged for its expertise in high technology, nanosciences and nanotechnologies, and Internet of Things, is thrilled to been able to be a participant in this program. Through this partnership, University of Waterloo aims to derive significant benefits in the training of HQPs (Highly Qualified Persons) in the area of Materials Science and their integration in innovative technologies. Advise our students to join the FAME+ Program. Promote the exchange of scholars for teaching and join research activities. Provide lectures for integrated courses or summer schools. Support the Academic Committee in the program evaluation. Through this partnership, The Department will be able to derive significant benefits in the training of personnel in the area of Materials Science. Although the FAME program has been targeted at training of students, it will also facilitate the direct collaboration of the principal investigators for whom the students work. This fostered collaboration will certainly be of mutual benefit to all partners in the program. University of Peradeniya, the largest national University in the country consists of 9 faculties of Agriculture, Allied Health Sciences, Arts, Dental, Engineering, Science, Management, Medicine and Veterinary Medicine. The University is aiming at becoming an international University by 2020. In this process, the University welcomes collaborations with foreign Universities as it can help the University in identifying the changes needed in the study programmes, academic calendar, administrative structure, management and facilities provided by the University.